In Thailand, if you want a good challenge, I recommend asking for your food “pet mah” (extra spicy). If you’re looking for something interesting and “genuine”, hit up the markets. But if you want to find rest and be overwhelmed by beauty, then you have to go to the waterfalls. 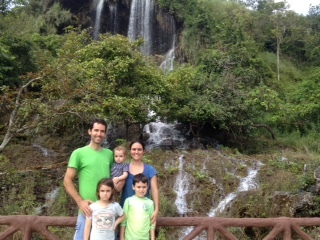 Three families of kids scaling the multi-leveled waterfall of Pachaeron. We hadn’t visited many waterfalls since our arrival up until last weekend. 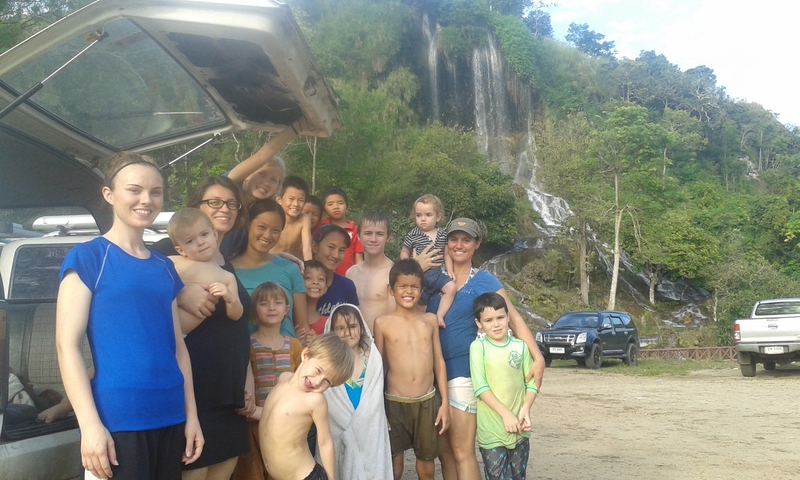 Our friends from Chiang Mai, the Heines, visited us and it seemed almost obligatory that we take them and their many children to a waterfall… or two! We headed to Namtok Pacharoen. The scenery is breath-taking. Much like the sticky-falls we’d visited when we arrived in Chiang Mai, the limestone from the mountain above has built up over time, creating numerous cataracts along the water’s descent down the mountain. The plants all around created a movie-like scenery that one only dreams of in the US. The most curious aspect of this waterfall though is the native inhabitants of the waterfall. Little fish abound in the water. Almost immediately upon entering the water they begin to nip at your feet, eating the dead skin away. I’m told that people pay for this service in the markets of Chiang Mai. We received this benefit simply for showing up. Village huts built in the style of common Thai hilltribes: Aca, Hmong, Lisu, Lahu and more. A larger contigent of us who went to the falls. 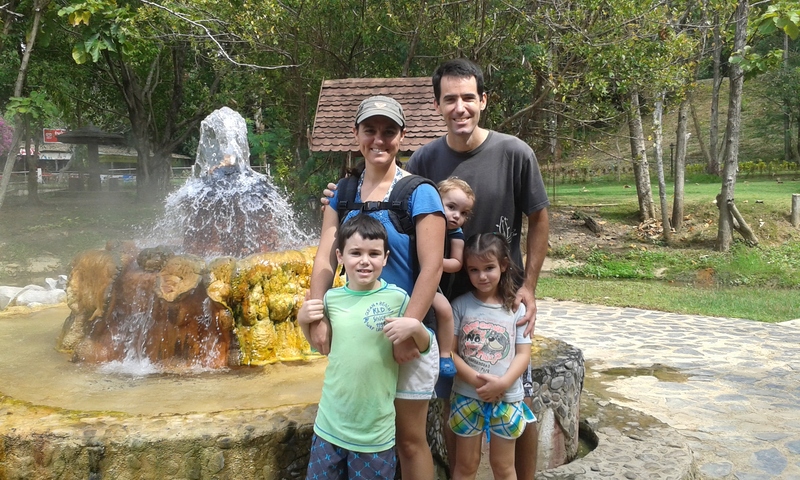 Once we’d all had our fill of walking up and down the waterfall and playing in a mock-village of huts built in the traditional ways of the various hill tribes of Thailand, we journeyed north to another waterfall. 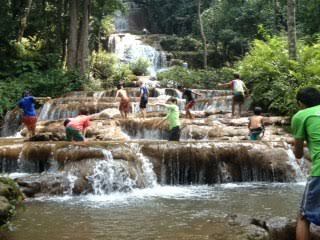 This waterfall, Namtok Ta Ra Rak, really epitomized it’s name though. From top to bottom it must measure at least 100 feet. At it’s base, the water flows down rocks creating a natural slide area where our children ran and and slid down over an over. The water was then collected into cement pools and from there flowed into a huge reservoir lined with salas (shaded lounge areas) with a bridge crossing into the middle. Most of us got to swim in it, doing flips off the bridge and throwing kids into the water. In front of the larger waterfall, Namtok Tah Rah Rak. This was probably one of the most fun days we’d had since arriving in Thailand. The kids were surrounded by friends. We were all surrounded by God’s beautiful craftsmanship. And as tired as it was to watch over so many children, we experienced a sort of rest and relief that we’d sorely been missing. The water in this fountain is scalding. It takes a while, but this is where the eggs are cooked. The following weekend, we journeyed with our friends from across the street north to another waterfall which also neighbored a natural hot spring. The hot springs lived up to their namesake. People actually cooked eggs in the 65-70 C water! This mini-resort is well-designed with areas that mix a local water supply with the hot-springs so that you can take off your sandals and wade in a slow-moving stream that eventually empties into a stream. I couldn’t help myself and stripped down to my swimsuit and laid down in the water with my kids. This was the closest I’ve had to a true bath in 6 months! Namtok Ta Ra Rak: lots of people but still lots of fun! Moving on from there, Namtok Mae Ga Sa waterfall was a few kilometers away. It too had the typical limestone-based, but the water is collected in a large cement pool. 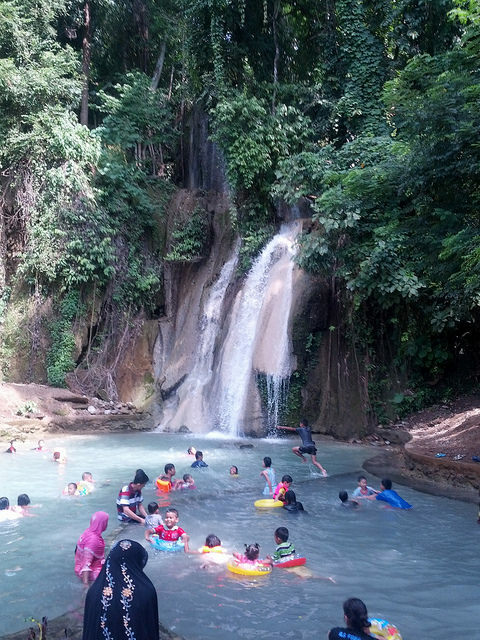 The kids and I had fun swimming up to the waterfall and playing on the small stone island in the middle. This waterfall had more of a touristy feel to it, but was very beautiful and offered a fairly easy hike-climb up to the higher tributaries. We hope to take a visiting friend with us to see it again in a few days. I probably sound like an advertisement, but if you ever come to Thailand, you have to visit at least one waterfall. You will not be disappointed. If nothing else, it will give you a break from the heat and allow for you to get some excellent photos. You’ll feel like you’re in a movie for while, but then you’ll wake up and realize that it’s all real and you’ll take with you an experience you will not soon forget.